University graduate Licensed Mechanical , Electrical, Electronics and Computer Engineer; More preferably with at least 2 years of experience in the same field; 2D (AutoCAD), 3D (Solid works), MS Office (Word, Excel, PowerPoint), Basic programming; Must be knowledgeable with tools & equipment (Oscilloscope, etc. ); Proficient in oral and written communication skills, good team player, strong analytical and problem solving skills; Hardworking, honest and responsible; Willing to work overtime; Can handle pressure and perform multi-tasking. College graduate of Electrical Engineering; Computer literate; With OSH related experience is an advantage; Licensed Mechanical / Electrical Engineer is an advantage; Can prepare and analyze report. College graduate of any Business related course for Jr Buyer; At least 2 years College graduate of any course for Warehouse Assistant; Must be computer literate, good keyboarding skills with experience using word and spreadsheet; Experience with or knowledge in Documentation, Planning, Purchasing, procurement and Supply Chain; Strong written and verbal communication skills. Male; College Level or College Graduate; Preferably Graduate of BS in Mechanical Engineering or Electrical Engineering; Can drive light vehicle. High school diploma or equivalent; Basic knowledge of HVAC, Plumbing and Electrical systems; Experience using hand and electrical tools; Ability to read technical manuals and drawings; Very good communication and interpersonal skills; Physical stamina and dexterity. Having at least 2 years of experience; Detail-oriented; Mechanical skills and documentation skills; Physically fit. Male / Female; With experience as Sales Executive in any automotive brand; With pleasing personality; Knowledgeable in motor vehicle specifications; With strategic selling skills; Computer literate; With good communication skills; Male applicants have driving skill. Male; Graduate of BS Industrial Technology major in Machine Shop or any Technical related course; Well-versed in reading assembly drawings; Able to express himself in spoken and written English; Can work and think fast accurately. Diploma or Degree in Mechanical Engineering (Licensed is an advantage); Supervisory experience with strong analytical skills in a manufacturing set-up; Proficient in Microsoft Office Application; Excellent written and verbal communication skills; Must be knowledgeable on design software (AUTOCAD or other CAD Software) to make drafts and fundamental concepts of the products to be worked on; Experience on a given field is an advantage. 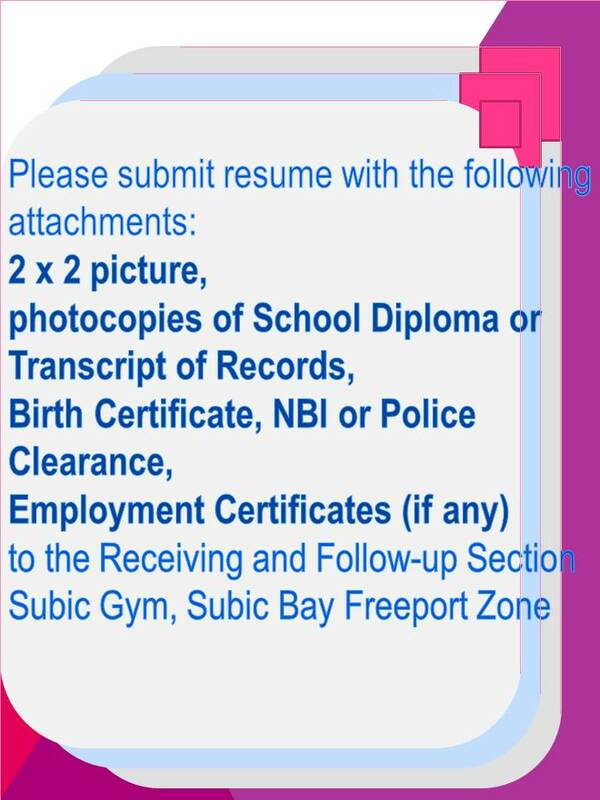 Male / Female; College graduate is preferred but Vocational course is also accepted; At least 2 years’ experience in Warehousing and/or materials management; Know how to handle inventory cycle counting with accuracy and in the safest, reliable and economical manner; Proficiency in MS Office; Able to express himself in English both oral and written; Willing to work under pressure; Can work and think fast and accurate. Male; Graduate of BS Industrial Technology major in Machine Shop or any Technical related course; Must have at least two(2) years’ experience in handling Conventional and/or Computerized Numerical control (CNC) machines; Know how to operate Milling Machine, Lathe Machine, Tapping machine Gear Cutting, Band Saw Vertical Machining Center, Drilling Machine, Hydraulic Press, CNC Machine, Lathe Machine, Tapping machine Gear Cutting, Band Saw and other related machines; Able to express himself in spoken and written English; Willing to work under pressure; Can work and think fast and accurate. Male; Graduate of BS Industrial Technology major in Machine Shop or any Technical related course; Must have at one(1) year experience in handling Conventional and/or Computerized Numerical control (CNC) machines; Know how to operate Milling Machine, Vertical Machining Center, Drilling Machine, Hydraulic Press, CNC Machine, and other related machines; Able to express himself in spoken and written English; Willing to work under pressure; Can work and think fast and accurate. Male / Female; Graduate of any 4 year technical course; Must have at least two(2) years’ experience in using AUTOCAD (latest version); Well-versed in reading technical drawings; Good leadership and coaching skills; Knowledge to conduct training of skilled Project Specialist in preparing technical drawing; Good communication skills both oral and written; Proficiency in MS Office; Willing to work under pressure; Can work and think fast and accurate. Male / Female; Graduate of any Engineering course; With experience in general office work such as handling of correspondence; Sales experience in a manufacturing firm is a plus; good communication skills, both oral and written; Proficiency in MS Office; Willing to work under pressure; Can work and think fast and accurate. At least 2 years of experience; Can be able to fix 6 wheeler and 10 wheeler truck. Can be able to drive 6 wheeler and 10 wheeler trucks. Female; College graduate or 2 years course graduate; Good in oral communication; Computer literate. Male; High school graduate of College graduate.